Believe it or not, there is a way to use Speedtest.net’s speed test service from a Linux command line. Usually, one would fire up a web browser and just go to Speedtest.net and the flash utility would load. Obviously, this is impossible from a command line. If you have a cloud instance or virtual private server (VPS), you don’t have a gui or a web browser. So, here is how to run an Internet speed test from the Linux command line. Personally, I like to select a specific server from a specific location when I run a speed test. I’ve found that the closest server, isn’t always the fastest. 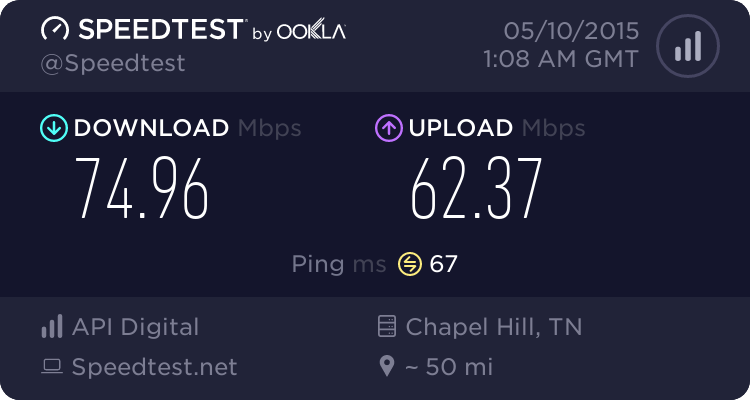 Just because a speed test server is located a couple hundred miles from you, it does not mean the path to it is linear, and it doesn’t mean their connection is fast enough to saturate your own. Not to worry, you can also select a server to your liking. There are two ways to approach this. You can either install the speedtest-cli package using your package manager, or you can download the script manually. I’ll cover both. There are some other pretty cool options available if you want to play around some more. You can display values in Bytes instead of Bits, use the URL of a Speedtest Mini server, and even select the source IP you want to bind to. If you want to check out the other options available, run this command. That’s all there is to it. If you run into any troubles feel free to ask for help in the comments below. Thanks!